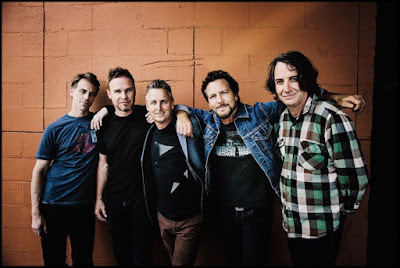 Pearl Jam has been selected as the official Record Store Day Ambassadors for 2019. Set for April 13, the annual event is held the third Saturday of every April and is a celebration of the unique culture surrounding nearly 1400 independently owned record stores in the US and thousands of similar stores internationally. This is the one day that all of the independently owned record stores come together with artists to celebrate the art of music. Special vinyl and CD releases and various promotional products are made exclusively for the day and hundreds of artists in the United States and in various countries across the globe make special appearances and performances. Festivities include cook-outs, body painting, meet & greets with artists, parades, djs spinning records and on and on. "Independent record stores are hugely important to me, and have been ever since I was 12 years old,” says Pearl Jam guitarist Mike McCready. “Before I even really knew what they were, there was a certain feeling of 'this is a dream come true,' and it's a wonderland and there's so much to learn in here… and it's still that way. "Support every independent record store that you can. They're really a good part of society. Know if you love music, this is the place to find it. And it helps people who work here and that's important, too. And it kind of takes an effort, you have to look for something that you want; you have to talk to people. I had to talk to people to figure out which Aerosmith record to get first or anything back in the day. It's a place to learn. It's a place to have fun. And it's a place to discover new music." Previous Ambassadors include Metallica, Ozzy Osbourne, Jack White and Dave Grohl. For more details on the twelfth annual event, visit recordstoreday.com.